My beloved ST1100 is about to bite the dust after a minor 'drop' caused more damage than the assessor is prepared to approve. I was looking to change bikes in any case as the ST weighing in at 320kg wet is the reason I dropped it. I'm not as young as I used to be so I struggle to keep it up. No problem when it's going, it's a fabulous and smooth machine. 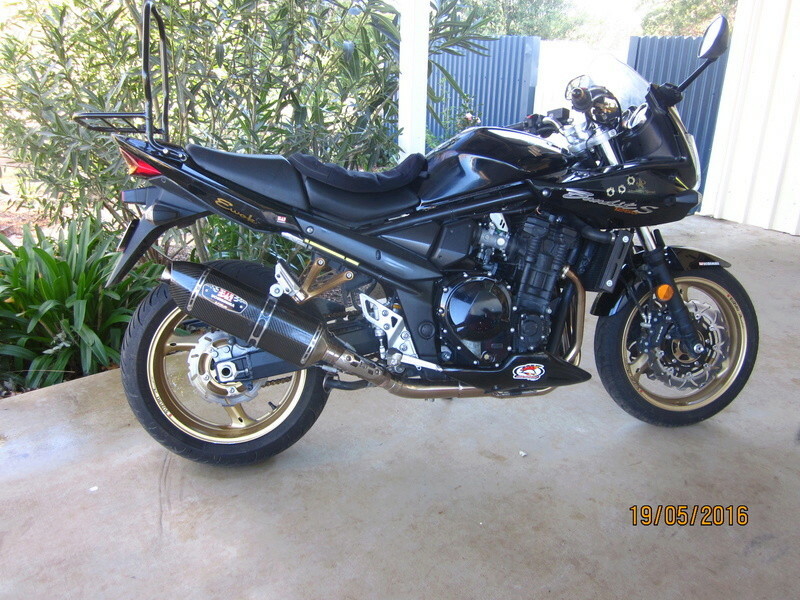 My mate just bought a 2013 Bandit 1250S so I started researching my alternatives. From all the reading I have done the Suzuki beats the Kwaka Z1000, Yammi FZ1, and the Honda CBR1000. I really like the look of the Kwaka but I'm not prepared to give up comfort and performance for my ego. So .... I would really like some advice from those of you who own the Bandit. I'm leaning towards bikes made after 2010 and I don't want to get anything before 2008. I just like the look of the subtle changes to the styling in the 2010 model and from what I've read it appears to be slightly better performance wise. I'm ok with more kilometers as I work overseas and won't be riding it heaps (maybe a few times a month) and my price range is between $5,000 and $7,500 so i'm pretty sure I can get a low kms older bike or a high kms newer bike in that price range. Any advice on whether there is any major differences in the rides? I do mainly runs through the hinterland around the back of the Gold Coast (Nerang - Beachmont) or Uki- Kyogle. That sort of thing. Not much highway riding or commuting. So if anyone has any advice on your preference and why it would be greatly appreciated. PS I'm 5'10" and had the seat on the ST lowered by 2 inches so I could plant my feet on the ground. When I sat on my mates I was a bit tipy toe on the ground but he's 6'. I believe you can lower the seat by 20 mm. Does anyone that is my height have an issue with the seating? The general opinion is that Suzuki went too soft on both the front and rear suspension of the GSF (and didn't change the rear suspension when they turned the GSF into a GSX, or at least, not in any worthwhile way). Many Bandits have retro-fitted firmer springs, gold valves, and 7.5 wt oil in their front suspensions - a very worthwhile mod. Rear wise, I put an Ohlins in (when the exchange rate was good) and it is hugely improved over the standard (mine also has the front suspension changes previously mentioned). Suspension improvements should be near the top of the wish list (take comfort in the fact that no changes are really necessary to the motor for everday riding). Most Bandits also have after-market mufflers (cans) and there is serious weight savings to be had by doing so (you do not need to add power commanders, modify fuel maps if you change the can). A big fault of the GSF1250S models (ie half faired) is that the headlight is rubbish, seriously rubbish - a candle would be better. The GSX has a different shaped headlight and is much improved. Seat wise - seems to be an individual preference. Lots of discussion on the forum. My 2010 GSF1250S has done over 87,000kms (I've owned it since new) and I haven't changed the seat. But I do use an AirHawk on longer trips and wouldn't be without it. The bad news for you, base don your comments, is that the seat is in the low position when sold and can be raised 20mm by a simple procedure. I suspect the one you sat on might have already been in the low position if that was not mentioned - but it would pay to check as he may have raised it. PS: many Bandits have suffered from blocked or failed fuel pumps. This is simply and cheaply fixed but don't go near a dealer if the problem arises. Plenty of good info here on how to fix it. I'll check the seat height. I noticed that a lot of bikes have mods on the Cans and suspension and I wondered why. I thought maybe you had to be a hoon to run a Bandit Now I understand. You bike looks fully sick - that's me channeling my 16 yo. No engine mods between models except for colour so a 2008 for $4000 will be a starting point for you. I'm 185 and can just touch the ground flat footed in the low position. Stock seat can hurt after 150ks, if you plan on taking a pillion they will slide into you without a sheep skin or triboseat cover fitted. Aftermarket headers bring the bike to life along with secondary throttle body removal. Easy to work on and bullet proof. The people on this forum are also great, even in person. Who would have thought Ewok was taller than 4 feet in reality I've owned my bike since 2007 brand new and it's never let me down. I concur on the suspension mods as it changes the bike. The only regret with the Bandit is that I never rode it to Philip island for last year's forum meet. Welcome to the forum btw.